I left off talking about Moses letting God know about His weaknesses. God already knew. He knows everything. We are deeply loved by God, yet the story isn’t primarily about us…it’s about God. 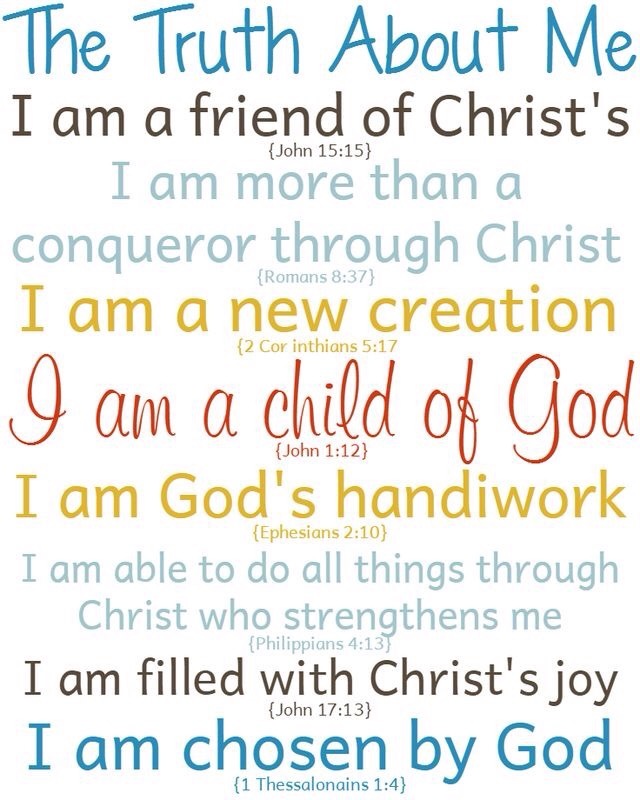 It’s about who God is. God has always existed. It’s His story for His glory, and we get to join His story. God knows our flaws, fears, weaknesses, insecurities, wounds, shortcomings, and still calls us all to join His story. If you read the Bible cover to cover you will find only one who is perfect and He is Jesus. He perfectly represented the Father. 1. It means we are who God says we are. No ifs, ands, or buts about it. He’s right in His assessment always. 2. Our confidence is to come from our identity in Christ, nothing else. Jesus plainly said, “I am the Vine. You are the branches. If you abide in Me, you will bear much fruit. Apart from me you can do nothing,“~from John 15:5. 4. It’s not about our weakness, it’s about His strength! 5. Even if we mess up, God has a redemptive plan. 6. Low self esteem and insecurity are not the will of God, nor is it humility. Ummmm…yeah! It’s something I’m learning to walk out. Confidence hasn’t always been applauded in my life. Some Christians labeled me arrogant for thinking I could hear from God and I didn’t have great experiences walking confidence out. If I stated I was a filthy sinner or worm, there was applause for my humility. Yet the more I searched the scriptures, the more evidence I found that God wanted us to accept His assessment of who we are. We were (past tense) dead in trespasses and sin. We were (past tense) sinners on the way to hell. Even in my occupation other women and some men made it their mission to sabatoge efforts for success. I am still walking it all out with you because God calls me way, way, way out of my comfort zone. I had zero desire to lead, be known, teach, preach, be on platforms, etc…leave me in a room with God alone and I’m as happy as can be. I had zero, zero desire to be a spokesperson for God. None. And God has called me repeadily to do what I never thought I could and many things I had no desire to do. After years of being somewhat beat down in ministry and enduring some intense persecution at work and with Christians. I am not talking about people just being rude either. I’m talking about being stalked, falsely accused, publicly humiliated and lied on, people trying to get me fired, cussed out in public places, vandalized property, people I didn’t know contacting me about gossip they heard, being removed from “friend” circles without warning, destroying my work samples….on and on…God calls me after this 7 year period of testing-(lets call it that), to minister to a stranger I met one time at a conference. My first response was, “Are you serious? Um no thanks.” God didn’t rebuke me like He did Moses. He kept nudging. “Will you go for me?” I was still hurting, still tired, over ministry, seeking rest and restoration. I had zero desire to go minister to someone I didn’t know. And I would hold things God gave me until I had courage to send them. It was hard. I had to overcome plenty of fear. Or at least move past it long enough to bless someone else. He would state the timing was on point. God had figured in my lag time. That one act of (delayed) obedience led to years of being obedient, faithful, facing fears, and just being a vessel God could use, even while broken. It was super challenging as I felt a truck had backed over my life, yet it brought about good things for that person and their family. It also helped me grow in God confidence. The purpose of me telling you is this…Sometimes, you’re going to be afraid. Sometimes you may feel really small or inadequate. Sometimes you may not be well received. Yet if you give it to God, He will do something beautiful. You may not be the benefactor. It may be someone else. It’s for His glory. I told God He could have all of my life. Since then I’ve had chances to walk it out. We are His workmanship created for His glory. Your reward for being faithful to God (He does like to give rewards by the way), may be in heaven where moths and rust do not decay. Some may be on earth, I can’t say. I do know it’s worth it to believe what God says about us and to step out of the boat! No one wins games by sitting on the bench. No one walks on the water by sitting in the boat! Papa God I thank You that Your strength is made perfect in our weakness. I thank You that all You say about us is true. I thank You that You are so powerful to heal us where we are afraid, weak, broken, and insecure. Our true confidence is in You! I bless everyone reading this with Godly esteem and God Confidence. In Jesus name. Amen. Amen, praying that all He says about me will be sinked in to my soul and spirit. Thank you for this perfect, oh so perfect word. Love you sis.